Dental implants are an innovative, long lasting solution for missing teeth. 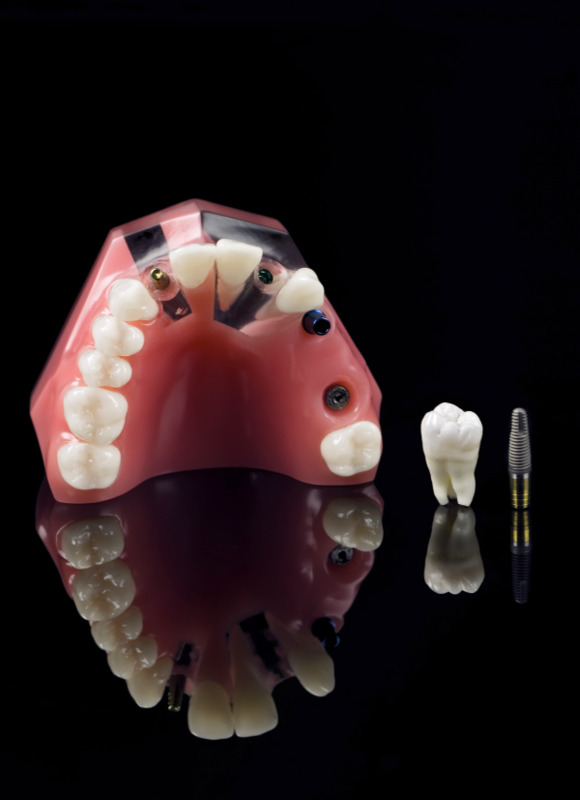 A dental implant consists of an artificial tooth root that a trained dentist places into the jaw bone. The artificial root comes in the form of a titanium screw that holds a replacement crown or bridge. Dental implants are ideal for patients in good general oral health, and who have lost one or more teeth due to disease, injury, or trauma. Dental implants look and feel natural – so natural that you may forget you ever lost a tooth! When placed correctly, dental implants can last a lifetime. If you are interested in dental implants in San Antonio, our state-of-the art dental practice can deliver high quality care! Dr. Craig Wright is an accomplished San Antonio implant dentist with the knowledge, compassion, and skills to complete your implant procedure safely, quickly, and without complications. Dr. Wright completed his preceptorship in Dental Implantology at the University of Texas Health Science Center at Windcrest, has studied at the Zimmer Institute in Carlsbad, California, and is a fellow at the International Congress of Oral Implantologists (ICOI). If you’re looking for quality care in implant treatment, contact us at Windcrest Cosmetic Dentistry. • Dental implants look and feel more natural, so you can achieve comfort and appearance standards. • A dental implant replaces a single tooth without sacrificing the health of neighboring teeth. A tooth-supported fixed bridge requires that adjacent teeth be ground down to support the cemented bridge. • Because a dental implant will replace your tooth root, the bone is better preserved. With a bridge, some of the bone that previously surrounded the tooth will begin to deteriorate. • Dental implants integrate with your jawbone, helping to keep the bone healthy and intact. • A single implant can be easier to keep clean than a bridge. Gums can recede around a bridge, leaving a visible defect when the metal base of the bridge becomes exposed. Resorbed bone beneath the bridge can lead to an unattractive smile. Overall, dental implants are the leading and best long-term solution for tooth loss. A major risk of bridges and removable partial dentures is bone decay, which can lead to a collapsed, unattractive smile. Additionally, the cement holding bridges in place can wash out, which invites bacteria. Finally, implants make eating and speaking easier than with removable dentures, as dentures are known to move around in your mouth and even fall out, causing annoyance. A dental implant replaces both a lost natural tooth and its root. This means you won’t have to deal with the inconveniences and health risks associated with dentures. 1. The implant, which looks like a screw or cylinder, is placed into your jaw. 2. Over the next two to six months, the implant and the bone bond together to form an anchor for your artificial tooth. During this time, you can use a temporary tooth replacement to minimize the appearance of gaps. 3. A small metal post, called an abutment, completes the foundation on which your new tooth will be placed. Your gums will be allowed to heal for a couple of weeks following this procedure. 4. A replacement tooth called a crown will be created for you by your dentist and attached to the abutment. This crown is created to match the color and pattern of your other teeth, so it looks almost completely natural. Once your implant procedure is complete, you will be able to enjoy your favorite foods, as well as the pleasures that come with having a beautiful, natural functioning smile. Dr. Wright is one of the top San Antonio implant dentists, and he aims to exceed your expectations! For more information about getting dental implants in San Antonio, the cost of dental implants, or to schedule a consultation, call us today!